Ever thought of diving without a tank? Exploring the reef, free of all the heavy gear! Here’s the different ways it can be done and what can scuba divers learn from those disciplines? Scuba diving is fairly easy to figure out what is: strap a tank on your back and breathe from it under water, and by default, you’re scuba diving. But remove the tank and things get a lot murkier, and often, terms like snorkeling, free diving, and skin diving is used interchangeably. But there are differences, and each has its advantages, and we as scuba divers can learn from them. Snorkeling is arguably the most popular activity of the bunch. Thousands and thousands of snorkelers take to the water every year on holidays or in their home waters. Snorkeling is defined as an activity where the participants use snorkel fins, a snorkel mask, snorkel, and possibly a buoyancy vest to help them remain afloat without strain. Now a days, many snorkelers also go for the full face snorkel option. They swim in the surface, snorkel in mouth, and look down upon the aquatic world below. An old term, that isn’t necessarily used much anymore, but is useful nonetheless, as it is what a lot of people do. Essentially, skin diving is snorkeling, except you dive below the surface when there’s something interesting you want to see up close. The snorkel is used in the surface, much as in snorkeling, and common diving equipment in terms of mask and fins are used. The newest and fastest growing of the activities is free diving. Many people have started referring to both snorkeling and skin diving as “free diving”, which is incorrect. Strictly speaking, freediving is a competition oriented activity. Using techniques to both inhale as much air as possible and to use as little oxygen as possible while underwater. And they either swimming vertically for depth dives or horizontally for long time dive. Masks are typically much lower volume than dive masks, more similar to swim goggles. Fins are much longer than dive fins, and monofins, where both feet are in the same fin, are sometimes used. Unlike snorkeling and skin diving, the main goal is to spend as much time underwater as possible. And time in the surface is only meant to re-oxygenate the body between dives. A snorkel is often not used. In very much layman’s terms, you could say that snorkeling is surface only, free diving strives to underwater only (or at least as much as possible), while skin diving mix the two. Participants in all three activities may not like this definition, but it can help others distinguish between them. As scuba divers, these activities can actually be very useful for you. It used to be that a skin diving dive was a part of all entry level scuba courses. Diving without a tank on your back can be very rewarding, as it allows a diver to feel a freedom of movement that you just don’t get with a lot of gear on. Also, a number of marine animals are easier to see and get close to when we don’t exhale bubbles, including whale sharks and dolphins. When traveling, it allows us to take a look below the waterline without having to bring or rent a lot of gear. For rescue scenarios, we don’t always have the luxury of dive gear and may need to assist a diver using only our fins, mask and snorkel. Snorkeling is very useful when taking non-divers out to experience the underwater world. This is especially if they are not completely comfortable with actual diving. Once non-divers sees the amazing world underwater, they’ll get a better understanding your obsession and why it’s so important to protect the ocean. You can also learn basic scuba skills from skin diving. Such as snorkel clearing this can be useful in the beginning and end of your dives. Descent and ascent techniques can also be useful skills to master for scuba divers. You can also read All the best Skin Diving Techniques. 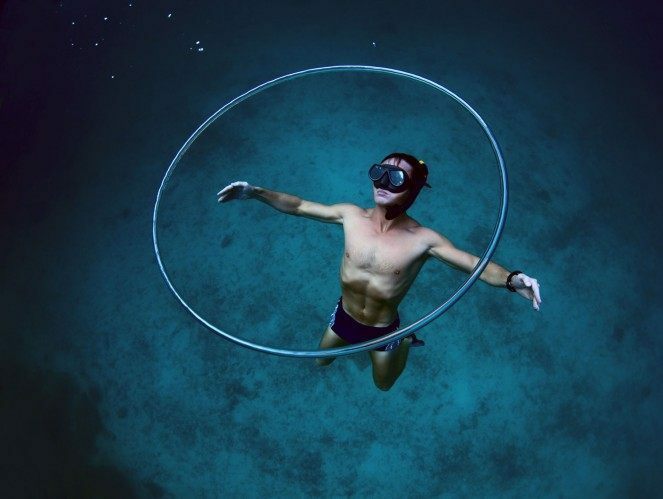 Free diving techniques can be used to further enhance your breathing and air consumption. Free divers have perfected skills of efficiently re-oxygenating the body and managing your breathing underwater. There are also a number of techniques for swimming underwater without using unnecessary energy, which you can use on almost any dive. Would you ever dive without a tank either to experience the underwater world or to enhance your scuba skills? Tell us in a comment below, we really want to know. I do both scuba diving and free/skin diving(I call it free diving but I don’t do it competitive) anyway, I’ve learned loads from skin diving that I use when scuba diving. It gives me a sense of feel for my body, knowing my limits and strengths underwater is priceless. I’m also quite sure skin diving made me master my buoyancy in a completely different, but better, way. Thanks for the clearing between skin and free diving. Great article! I’m a new to diving but been diving without a tank for quite some time. I have been skin and free diving for years and are now opening by eyes to the tank. I’m glad I can use my free skills to get better at scuba. Thanks, and I might have to bring my none diving gf on a snorkel, to show her the wonders. My family has been wanting to go on a tropical vacation for many years and this year we are trying to plan one. You mentioned that snorkeling is defined as an activity where the participants use full-foot fins, mask, snorkel, and possibly a buoyancy vest to help them remain afloat without strain. Do most snorkeling companies offer equipment to rent? Finding a place that offers snorkeling tours could be a good option. Yes. Most places include the equipment. I prefer no life vest as it gives you more freedom. Having lived on the south shore of Long Island,NY my entire life I went from skin diving from an early age, to scuba. Now it seems, mostly due to time constrictions, I’ve come full circle and find myself skin diving again. Whenever I am out paddle boarding I always keep my mask and snorkel with me allowing me to dive in if I see something that looks interesting. I live in Cyprus and have been snorkeling and skin diving for the last 11 years here. I once had a trip to the Gulf of Akaba in Jordan and had a few Scuba dives, it was amazing and would love to do it again but it’s a lot easier to keep a snorkel, mask and flippers in the car. My wife loves to go too… and the icing on the cake is now our 4 year old girl has a snorkeling addiction, which is cheaper and better than a games console!!! lol..